11.25: The Band performed their final concert on this day in 1976, at Winterland in San Francisco. One of the best unheralded bands to emerge intact from the ’60s, The Band (yes, kids, it’s a band called The Band) gained their chops when they backed Bob Dylan on his first electric tour. This may not seem like a big deal today. So what? Dylan changed styles. Big deal, right? Wrong. His fans hated it and hated him for doing it, for putting down his acoustic and amping up his sound. They booed and cursed him, and the guys in The Band learned how to play on that tour, learned what it took to capture an audience and hold them, even a hostile audience. This carried over into the rest of their career. The Band went on to successful tours of their own and to record such classics as “The Weight,” “Up On Cripple Creek,” and “The Night They Drove Old Dixie Down.” Filmed by an up-and-coming young filmmaker named Martin Scorsese, that last performance saw release in movie theaters two years later as The Last Waltz. Featuring a grand performance by The Band, The Last Waltz also included a slew of world-class guest musicians, such as Bob Dylan, Van Morrison, Eric Clapton, Neil Diamond, Muddy Waters, Joni Mitchell, and Ringo Starr. Arguably one of the best, if not the best, rock film ever made, we cherish every moment of The Last Waltz, and so should you. It’s bittersweet to watch this performance knowing full well the last bow is coming, yet it’s also invigorating to watch this performance, realizing the full musicality of every single member of The Band. Seek it out. 11.26: On this day in 1939, The Queen of Rock & Roll, Anna Mae Bullock, found out what love had to do with it when she confidently sauntered into this world. The singer, better known as Tina Turner, was born in a Brownsville, Tennessee hospital. We’ve previously spoken of Tina’s split from Ike Turner in the ’70s and her subsequent rebirth in the ’80s, but it was in the late ’50s when Tina spread her wings for the first time. That’s when she joined Ike’s soul revue, Ike Turner and the Kings of Rhythm, at the tender age of 18, going by the name “Little Ann.” It wasn’t until one of Ike’s other singers failed to show for a recording session that Little Ann took the spotlight, singing lead, while pregnant with Ike’s child, on “A Fool In Love” and earning Tina her first hit. This almost never came to pass, however, as her vocals were intended only as a place-holder until the proper, intended, male vocals could be dubbed in. When Ike sat down and finally listened to Tina’s version, though, he saw the entire direction of the band change, and with it their name and Little Ann’s name. From then on they were known as The Ike & Tina Revue and Tina Turner, respectively. The beginning of a long, amazing, and storied career began right there. Tina’s longevity is no coincidence. She’s earned every accolade and hit, showing the showmen how it’s done. 11.27: Digital file sharing, it seems, wasn’t the first way the recording industry’s been threatened by people sharing music. 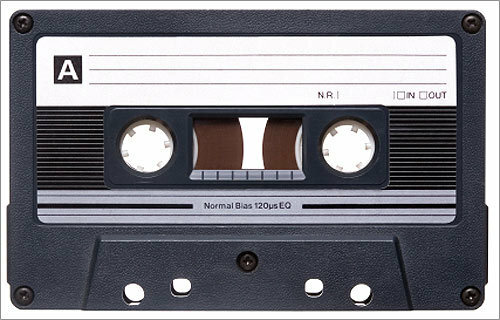 Way back in the dinosaur era of cassette tapes, the British Phonographic Industry (BPI), the UK’s music trade association, issued a statement on this day in 1981 denouncing the newfangled cassette tape as the death of the music world as we knew it. The BPI began a campaign called “Home Taping Is Killing Music.” This, of course, came true, as bands and singers were no longer able to make money and there were no massive hits or concert tours or merchandise sales or records sales from that day forward, and music vanished from Earth, never to be heard again. Damn you, cassettes! You ruined music forever! Wait…what’s that you say? The ’80s saw popular music become bigger than ever, as well as the rise of alternative music and hip-hop? Well, what about cassettes and home taping? Oh, they actually helped spread music to the masses and helped artists gain fans where they otherwise might not have? Oh, okay. Never mind. 11.30: The rebel yelled for the first time today in 1955. Billy Idol took his first steps toward white weddings, Mony, eyes without faces, and rockin’ cradles of love. Born William Michael Albert Broad, Idol supposedly gained his nickname during his school days, due to his idle ways. Joining a handful of bands in the ’70s as a guitar player, including an early incarnation of Siouxsie and The Banshees and a punk band called Chelsea, Idol moved into the lead singer position with his next band, Generation X. Lasting five years and three proper albums, Generation X tried to remain true to its punk origins, while attempting to pursue more of a rock sound. Tensions boiled over between Idol and other band members due to this dichotomy, however, leading to the departure of the guitar player and the drummer. Pounding it out for one more album, which included an early version of Idol’s first solo hit, “Dancing With Myself,” Generation X finally called it quits in 1981. Which, of course, allowed Billy to pursue a solo career full of massive rock hits, ubiquitous early ’80s videos, and, the cherry on the sundae, a cameo in The Wedding Singer. Man, Billy’s got the life. 12.01: The Divine Miss M, Bette Midler, the wind beneath our wings, was born on this day in 1945. Though the kids today (fists shaking in front of our grumpy faces, scowls etched upon our elder brows) may only know Midler for her schmaltzy, monstrous hit song from Beaches or her now-intermittent acting, we know her as a monumentally talented performer, who’s been doing it well for many, many years. Midler got her big break at Continental Baths, a gay bathhouse in NYC, in the early ’70s. Midler’s one of two megastar artists, of whom we can think offhand, to get their start there. Her piano accompaniment came from a young musician and producer by the name of Barry Manilow, who would, as you may or may not know, rule the adult contemporary airwaves for a good portion of the ’70s. Miss M moved from the bathhouse scene to the mainstream to the movie screen with ease, releasing her debut album, The Divine Miss M, in 1972 to commercial and critical acclaim, winning a Grammy for Best Newcomer the following year, and earning an Academy Award nomination for her portrayal of a talented, yet doomed, singer in The Rose (based loosely on the life of Janis Joplin) in 1979. Divine, indeed. We want to thank Midler’s parents for their horizontal mambo nine months prior to her birth and for bringing a great talent into the world, that one song mentioned previously, which we shall not name, notwithstanding. 12.01: On this day in 1999, indie rock pioneers Pavement announced their retirement. Formed in 1989 by Stephen Malkmus and Scott Kannberg as an exercise in studio production, the band eventually became a real band by 1991. That is, they added a drummer and bassist and played live shows to actual live people. Their first two albums, Slanted & Enchanted and Crooked Rain, Crooked Rain, considered and revered by many as masterpieces of indie rock, flirted with the mainstream, but Pavement’s path would not take it into the everyman’s CD collection. Which, it turns out, was fine with both the band and their fans, alike, preserving their reputation and their sound forever. Pavement released five albums in their decade-long life, but their influence has reached across the decade since, as well, inspiring musicians and bands with their lo-fi garage sound, their distinctive voice, and their overall awesomeness. Reuniting in 2010 for a worldwide tour, the band proved that they still had it, but since that tours ending, they’ve not promised anymore shows or new music. Stephen claims that he isn’t into writing in the Pavement idiom anymore, but, really, only time will tell, as feelings change and people change and who knows what they’ll wanna do in the future? Not us. We’re just happy for everything that Pavement has been given us in the past 20+ years.